This table, built in 1996, evolved from the Charles Prowell-inspired dining table I built in 1993. Each piece I make is part of an evolution of design priority and aesthetic. For example, the dining table made in 1993 had straight lines, rectangular legs, exposed joinery, and a certain heft or volume. 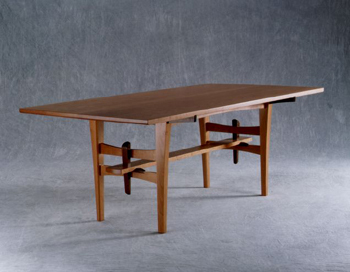 The 1996 table has six-sided legs with facets and curves, less emphasis on joinery (with only the wedge through the lower stretcher remaining from the 1993 design), and a lighter volume and feel. I wouldn't say one is better than the other, but my style has changed as each project and piece leads to the next. The top is made from two planks of solid cherry wood that were bookmatched to highlight the organic symmetry of its wood grain.